Hello, my name is Len. My team and I work with law firms around the country, helping sites rank, and developing content which ranks and converts. Since I am already watching personal injury lawyers around the country daily, sometimes I document my findings here. Today I am taking a look at San Diego California. I won’t completely spill the beans here and I will also refrain from pointing out anyone who is cheating the system. San Diego Personal Injury Attorneys / Deon Goldschmidt #1! I am a little confused by this firm. Is the name of the practice actually “San Diego Personal Injury Attorneys”? Regardless, Deon’s site (www.sandiegopersonalinjuryattorneys.com/) is currently #1 in San Diego. This is a WordPress based website. The McClellan Law Firm At position #2 we have this highly awarded attorney with an interesting custom website. The Kindley Firm, APC Here’s a Joomla site; I haven’t seen one of those in a long time. It looks fine and much more importantly the site ranks third. Gomez Trial Attorneys So this is a WordPress site with lots of interesting things going on… First, there is a video section… But the videos are not hosted on YouTube… I think I see where they were going with this.. There are also many subdomains in place, such as bicycle.thegomezfirm.com..
Steinger, Iscoe & Greene Ah yes, InjuryLawyers.com. I have seen this domain before in Florida. This is another WordPress website. Jurewitz Law Group I like this WordPress site and there is an active blog with lots of little articles popping up on it regularly. Good job. Estey Bomberger Another nice looking WordPress site. There are some pretty sites in San Diego. Of the attorneys on the front page I am pretty happy with 1 of their blogs. I am not going to point out which one here but I definitely feel like there are lots of law firms in the San Deigo area who could benefit from content. Not just having a blog and words on a page but a strategic and constant blast of articles from someone who writes for the web for a living and understands California personal injury law. If you need assistance with this please see my page dedicated to personal injury content. Some attorneys are using AdWords in conjunction with local rankings but the vast majority of firms running pay per click ads do not rank on the front page. There are even some attorneys from out of town with deep pockets running ads here. A couple of the attorneys are using remarketing which I have mixed thoughts about. If you are an attorney who has had success with remarketing I would love to hear from you, just to pick your brain. I will make sure the call is worth your time. Sometimes called the “map results”, the Google results for attorneys have been in flux lately with the advent of the Google Possum update. Prior to September 2016, San Diego local results strongly correlated with organic rankins. While this is still the case, at the moment we have “Injury Trial Lawyers, APC” in the local pack (who ranks on page 2 organically). Law Offices of Michael Pines, APC has an amazing number of reviews. If they had front page rankings they would likely get a local result which would stick out like a sore thumb as they have over 100 Google reviews at the moment, literally eclipsing everyone else. Wow. Same goes for Harris Personal Injury Lawyers, Inc. with 45 reviews. Backlinks are still the #1 ranking factor in Google’s algorithm and this is probably not changing again any time soon. Here are some of the places attorneys in America’s Finest City get links from. I can also tell you, having ranked LA attorneys multiple times, that the backlinks here are lacking. This is great news if you are looking to digitally enter the market here. Also note, not all of these links are good! (some are actually bad! When it comes to links, you want quality, not quantity). I am shocked that in a city of 1.4 million people the competition is not more fierce. I have closely observed attorneys in Chicago and ranked attorneys in LA and I have got to say that the attorneys there fight tooth and nail and have huge budgets. 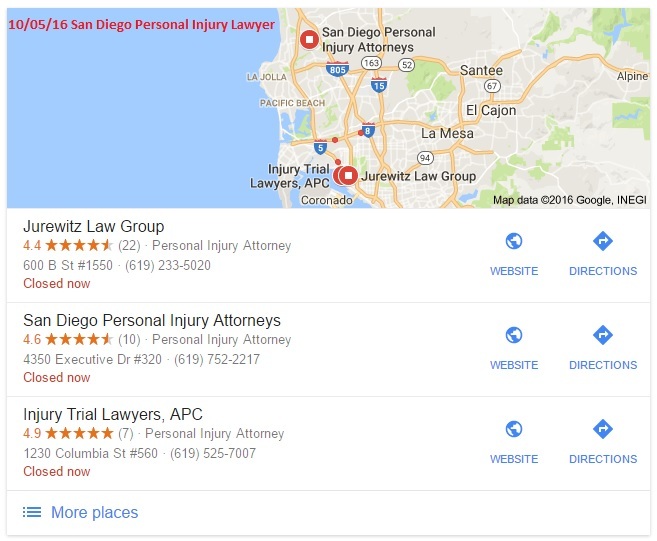 There is a huge opportunity for attorneys in San Diego to dominate the Internet in their area and I could absolutely help someone achieve this as I have in many other cities. If you need this service feel free to reach out to me today. I have plenty of references and while I am retained and exclusive in most parts of CA, at the time of this article I am available in San Diego.